In 1982, AR&BE Corporation was founded in Tokyo as a trading company. Our strength is extensive use of resources which our parent company Sakamoto Sangyo Co., Ltd., a KOBELCO CRANE’s authorized distributor, has accumulated from decades of experiences in the relevant industries. Strong network among industries, wide experiences in sales, repair, maintenance, know-how, and etc are the part of them. Not simply in sales and export, but in maintenance before shipment, assembling machine at customer’s yard, sending supervisors, repair, parts supply, we flexibly adapt our resources for customer’s request. Since foundation, thousands of used construction machinery was delivered to all over the world. Through these experiences and reward, we contribute ourselves to promote "made in Japan" products to overseas today. This year, we absorbed R&B Engineering Co., Ltd who was affiliated with us in 2007, and "newborn" R&B Engineering Co., Ltd. has started. 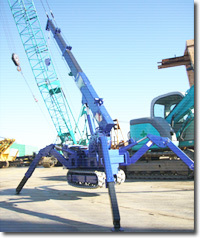 As a manufacturer of "MIGHTY CRANE", we commit to new effort to contribute to relevant industries and society. Manufacturing and sales of "MIGHTY CRANE"
AR&BE Corporation (the former) R&B Engineering Co., Ltd.
1982 ･AR & BE Corporation was found with 100% capital injection from a parent company Sakamoto Sango Co., Ltd.
･changed its name to "TOA"
1995 ･expand coverage to Europe, Middle East, Oceania, America etc. 1996 ･changed its name to "NEW TOA"
･started international promotion of R&B Engineering "MIGHTY CRANE" ･became a subsidary of Sakamoto group changed its name to the former "R&B Engineering"
（new born）R&B Engineering Co., Ltd. Copyright © 2008 R&B Engineering All rights reserved.